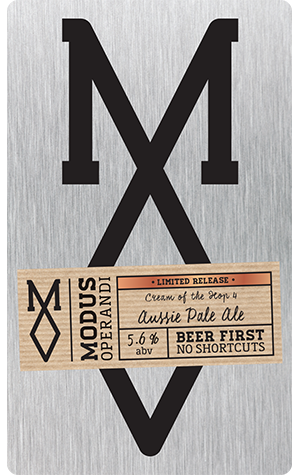 The fourth and final Cream of the Hop release from Modus Operandi in 2015 seems to underline a change of direction for the series. Having begun mid-year as a way to showcase a single experimental hop, subsequent releases have gradually moved away from that idea and morphed into a wider in-house experimentation program. The one important constant still holding it all together is that all the Cream of the Hop beers use the same wheat-heavy grist as a base, though they’ve no longer restricted themselves to using an experimental hop, a single hop, or even the same yeast. So it is with Cream of the Hop #4 which uses a plentiful amount of Cascade hops through the boil and an experimental ale yeast that brewer Dennis de Boer says “lends a much fruitier flavour”. When that's lent alongside dry hopping with El Dorado, you’re looking at a finished beer that’s far fruitier than its three predecessors and, ultimately, quite a resinous affair; brewery owner Grant Wearin described it along the lines of being an IPA drinkers’ pale ale. These beers may be experiments with the brewers having no deliberate intention to reproduce them again, but you need only think of their Simmy Minion to see how test ideas can develop a life of their own: released in August and named Australia’s Champion Pale Ale in October, it was added to Modus’ permanent range in December as their flagship pale. The bottom line is these guys make a damn fine hoppy beer so anything new – experimental or otherwise – is bound to be worth chasing down.